Looking for an omnibus edition of The Cygnus War that compiles all seven story arcs into a single paperback? It’s here, it’s awesome, and it’s cheaper than buying all seven books separately. This book is a must for any sci-fi fan. Check it out today! Not familiar with The Cygnus War? You can read most of the series online (for free) at http://www.cygnuswar.com ! It is the dawn of the twenty-third century. Space has been good to the pioneering men and women of the Terran Commonwealth, but in spreading out among the stars and fledgling colonies, mankind has become a rich target for the enigmatic and predatory Cygnan Coralate, a swarm-like civilization that acts with all the cohesion and decisiveness of a single entity. But humanity is not defenseless– filling the skies with swarms of its own ships, the Earthside Government has drawn a line in the intergalactic sand. At the forefront of the fighting is the Terran Warship Von der Tann IV, home to the legendary semi-atmospheric fighter wing, Minerva Squadron. Follow their struggle for survival as they battle the Cygnan Coralate across the interstellar killing field, blast enemy rigs out of alien skies and plunge headfirst into the unknown in this gripping saga of three women and their struggle to love, to live and to hang on to their humanity in a time when the only thing left for the human race is to fight or be forgotten. Who will live and who will die in the cold, cruel vacuum of space? Only time will tell. 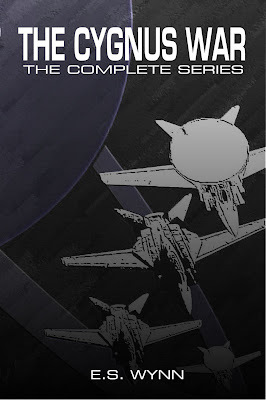 Thrilling squadrons of fans from all over the globe since 2005, The Cygnus War is a story that looks at love, war, and what makes us human in the wake of an interstellar war with the Cygnan Coralate, a shadowy enemy bent on nothing less than the total and complete annihilation of humanity itself. Order your copy today! Click here.